These are screen shots from "MircroReport, a microaggressions reporting app Christy Byrd used in her study. 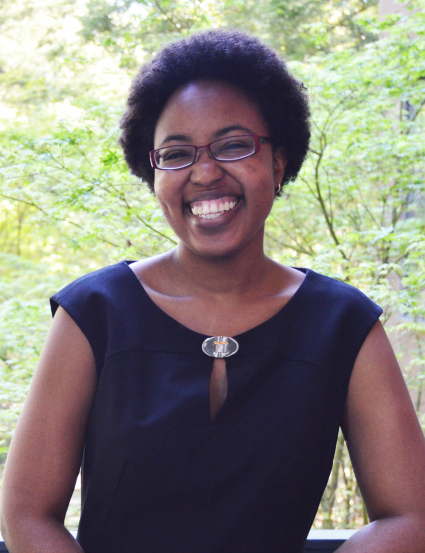 For the past year, UC Santa Cruz assistant professor of psychology Christy Byrd implemented a mobile app to track student experiences of microaggressions—the subtle ways assumptions and attitudes based on race, sexual orientation, or gender are communicated in everyday conversation. Byrd will discuss her initial findings at Colleges Nine and Ten’s quarterly faculty speaker series Wednesday, Oct. 26 at 5:30 p.m in the Namaste Lounge. “A microaggression is any slight you perceive is based on a social identity you have,” she said. They can happen across identities. They also happen anywhere: with friends, at the coffee shop, in the gym, even in the classroom and on campus. 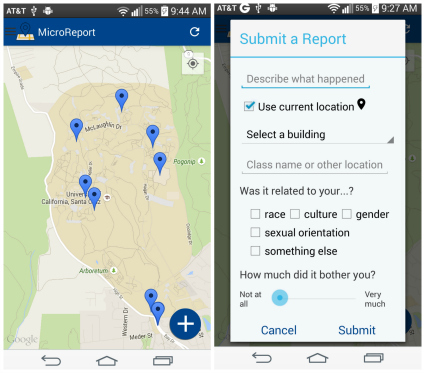 As part of her study, Byrd launched the mobile app MicroReport that allowed UC Santa Cruz students to report microaggressions they experienced or saw in the community. App users could also view reports of others. Six hundred incidents of microaggressions and other forms of discrimination and stereotyping were reported by more than 300 students. Often microaggressions are unintentional, but come with hurtful consequences. Byrd shares that students who reported microaggressions are more likely to express depressive symptoms and higher stress. “We found that perceptions of more racial microaggressions were associated with lower self-esteem, lower feelings of competence for daily life, more depressive symptoms and more stress,” she said. This was based on 211 participants in the sample, controlling for gender, race, and social class. These emotional reactions were based on their responses to a follow-up survey. The app is closed while Byrd and her lab analyze and organize the data. But the conversation about how to handle microaggressions is ongoing. In addition to Byrd’s Oct. 26 talk, she will also deliver a workshop Jan. 19, 2017 at Cowell/Stevenson. More information will be available closer to the date.